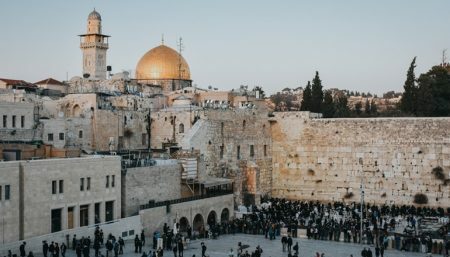 One of the most revered places in the world for followers of the three monotheistic religions, the Old City in Jerusalem is rich in important religious and historical sites. Also renowned for its magnificent views, authentic shopping experiences and diversity of cultures, languages and faiths, the Old City offers something for everyone. Only in the Old City can one find an incredible blend of tourist sites, captivating heritage, wondrous archaeological exhibits and monumental structures that are sacred to all people. Religion, history, sanctity and the mundane seem to come together magically in its charming alleyways. The Old City offers a rich cultural life, as well as entertainment and pleasure day and night – visiting amidst the colorful spices in the market, the aroma of knafeh and fresh hummus, watching festivals and nocturnal performances in quaint hidden locations, musical and theatrical tours as well as spectacular light and sound displays. An experience such as this can only be found in Jerusalem. Make sure to set aside a few hours to stroll around each of its four quarters – the Jewish Quarter, Christian Quarter, Muslim Quarter and Armenian Quarter. You’ll be astounded by the varying structures, religious attire, stories and people.